Having not played a match since Wimbledon, Maria Sharapova came into the year-end WTA Finals not knowing quite what to expect. She won all three of her round robin matches but fell short in the elimination rounds, squandering a 5-1 lead in the second set to Petra Kvitova and losing 6-3, 7-6 (3). Her press conference transcript, provided below in full, is courtesy of FastScripts by ASAP Sports. Do you think it’s pretty strange, the fact that the two players who won three matches in the round robin both lost in the semifinals to two players that won only one match? Do you think it’s strange or can happen? MARIA SHARAPOVA: Obviously it can happen. Yeah, I think it’s a unique situation and doesn’t happen often probably, but that’s, I guess, what makes the round robin interesting. It’s a format you don’t quite know. If you don’t start well you still have a chance. Yeah, it happens. 5‑1 for you in the second set. What happened? MARIA SHARAPOVA: Yeah, felt like I took my foot off the gas. Started the second set aggressive in the court forcing her to go for a little much, and then felt like I backed up a little bit. I gave her more time, more angles, and she took advantage of that. You played each other many times and you know her game well. Is it a bit unpredictable that you don’t know which Petra is going to show up on the court? Did she take you by surprise at all? MARIA SHARAPOVA: She’s a top player and a Grand Slam champion, so I don’t know how many surprises ‑‑ I mean, I’ve seen a lot of surprise in my career, different players, but I know what tennis she is capable of playing and what level she capable if playing at. She definitely showed that today. Can you sum up the week and how this now sort of frames your approach for Fed Cup final? 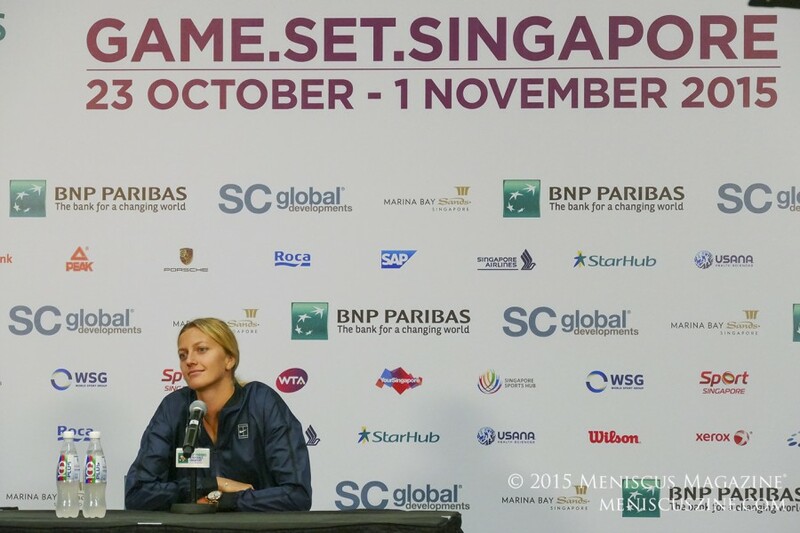 MARIA SHARAPOVA: Yeah, as I said, I didn’t have expectations coming into this week. Of course it’s always tough to sit after a match and say you’re happy, especially after you lose it. But I think it would be quite unprofessional of me to not take a lot of positives out of this week. I think there’s a lot to look forward to in the off‑season and next year, yeah, as well as couple of the matches in two weeks. What parts of your game are you most pleased with? MARIA SHARAPOVA: Well, one, I think the physical aspect. I was able to play quite physical matches and get through them. I think that was something that I wasn’t sure of coming into this week because I hadn’t played a lot. You try to stay fit, but it was just really good to be back in a match routine and just go through the days knowing that you have a match ahead of yourself. It’s a good reminder. You lose that a little bit. No matter how much you train, no matter what you do in cardio and drills on the court, nothing really gives you that feeling like when you’re on the court. So I felt like I gained a lot. I gained that match, physical strength in my body as well as mental. Those little things that are just tough to explain, but you really feel them when you go out on the court and compete. How much would you say the lack of match play had to do with how ‑‑ you served for the second set twice. You had a set point on her serve. How much of a factor was that, do you think? MARIA SHARAPOVA: Could be definitely. I had many opportunities in this second set. But like I said, I mean, I felt like I just stepped back a little bit and I stopped doing the things that really worked for me. Did you feel like you came out a little bit flatter today than you had in the earlier matches? MARIA SHARAPOVA: Well, yeah. I got broken the first game; I broke back. Yeah, but that also happened against Flavia and I was able to have a really good, dominant second set. Just depends on the situation, I guess. Talk a little bit more about Petra. She’s up and down, but when she’s on, she’s on. Forehand is good; backhand is good; serve is very good, no? MARIA SHARAPOVA: Absolutely. She’s a very aggressive player. She has a lot of depth and power. She goes for her shots. I think when she commits to her game and she executes, it’s a very powerful game. MARIA SHARAPOVA: That sounds depressing. You’re making it sound depressing. No, no. I would like to know if you’re really keen to do the best next year? Your professional life is going on and on and on? MARIA SHARAPOVA: Yeah. I mean, I don’t think I probably would’ve played this event if I wasn’t excited about the opportunity that maybe I could get next year. Yeah, look, usually after your last match here I’m already flying on a holiday, but I’ve got another couple of weeks to play Fed Cup. Then, yeah, hopefully have a little bit of fun and then get back to work. Yeah, that’s kind of the cycle of the game. MARIA SHARAPOVA: What’s a full power team? I’m assuming you’re part of that. Can you just talk about playing away Fed Cup? Is that kind of atmosphere something you thrive upon? You looking forward to it? MARIA SHARAPOVA: Yeah, I am, but it’s something I’ve never been a part of before, so I don’t really know what to expect. I was really proud of how the team came through in Germany, because I knew they were the underdogs coming into that match. Yeah, I felt like last minute I couldn’t play, so that was disappointing, so I’m really glad that I have another chance to compete and be part of the team. I had a really terrific experience in Poland with everyone. Yeah, ‘Nastia was a really great team leader and I’m excited to be a part of it again. I don’t know what to expect. I know it’s going to be much more difficult than the first time around, but it’s never easy playing away and never easy being in the final as well. Yeah, I just look forward to the experience. Something new for me. In 2007 at the Championships, you had your Championships end in a loss, but it was a positive experience. We saw what happened in January in 2008. Does this feel at all similar to that, or no? MARIA SHARAPOVA: Yeah, it’s tough to compare. I also went and had shoulder surgery at 21, so I could give you a lot of different examples of what happened in that year. Some were good and some not so. Of course I have to take the positives out of this week. I think that would ‑‑ as I said, that’s really important. I guess these are the types of little breakthroughs that you look for. I would say it is for me because I just haven’t been competing in a long time. As tough as it is to lose today, it’s definitely a positive that I came here, I competed, I won three matches, and, yeah, got to look forward to next year. Back to Prague. Going to be fast. She obviously likes it. You played a Wimbledon final. Talk about that a little bit. MARIA SHARAPOVA: Yeah, actually played ‑‑ I think we’re playing on the same court, but played an exhibition there, randomly enough, and it was quite fast. Yeah, look, I like playing indoors on fast surfaces. I know the girls have played a lot of matches on that court, so of course that’s a big benefit their side. But when you’re in this situation, I think there is a reason why we play the matches. It’s to see the results and be part of it. As I said, the experience is what I’ll be taking out of the whole thing.